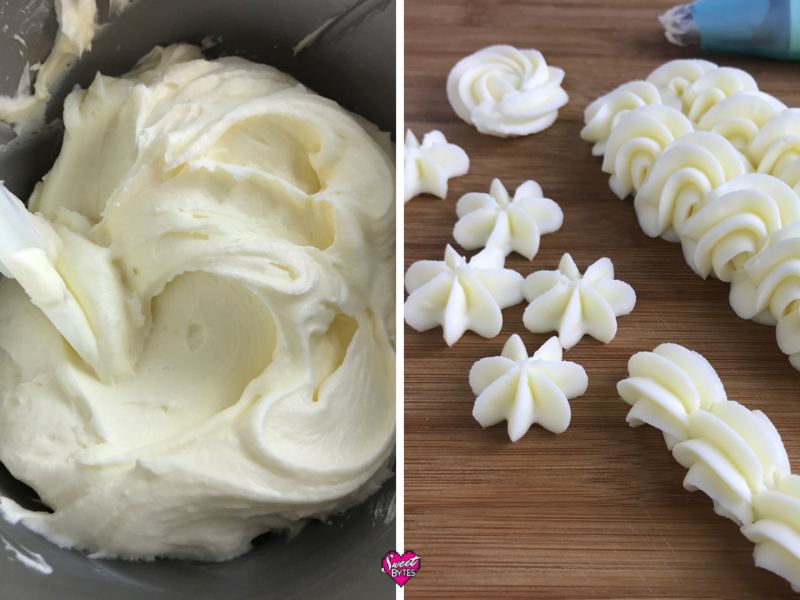 IF you have been searching for that perfect cream cheese frosting recipe and coming up short, give this one a try! It’s a keeper. A cream cheese frosting recipe where the flavor of the cream cheese shines and the sweetness isn’t overpowering is what I call perfect! Spreadable, pipeable, and completely eat with a spoonable. Cream cheese frosting is another one of my favorite things. I still remember the first time I tasted it. It was on a “dead armadillo cake” at a wedding. That just sounds revolting now, but during my childhood in Oklahoma…er… SEVERAL years ago… that was the thing to have for a groom’s cake. It was really just red velvet cake made up to look like an armadillo. Why? I have no idea. It was just like this scene from Steel Magnolias (a wee bit of profanity at the end). The point is, I thought I was tasting some gourmet thing from the future. At my house, such deliciousness did not exist. We had canned frosting from aisle 5 and it DID not taste like that. My mind was blown and my heart was captured! 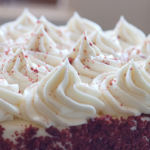 What is cream cheese frosting? If you haven’t experienced the pure love yet, let me enlighten you. Cream cheese frosting is just like an American buttercream recipe. It’s made from butter and powdered sugar, with the exception of added cream cheese. By adding the cream cheese, a richness and tanginess are imparted to the flavor. I think it’s probably one of the most genius creations of mankind and we all take it for granted. What makes this cream cheese frosting recipe so amazing? 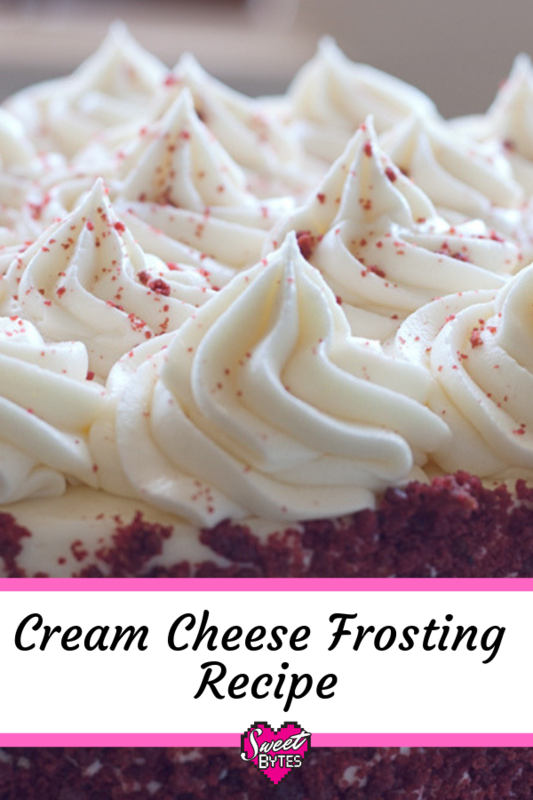 A friend told me it tastes more like cheesecake than typical cream cheese frostings. I think that’s a good comparison. My recipe has more cream cheese and less sugar, allowing the true flavors to shine. In other words, it’s not too sweet but full of wonderful flavor that complements so many treats. From cinnamon rolls to carrot cake, from graham crackers to strawberries, if it can hold the blob of frosting, it’s a contender for cream cheese frosting. True fan here. There are many claims of being “the perfect cream cheese frosting recipe”, I think I’ve tried them all. So many are just too sweet. That is the number one complaint I’ve seen about other recipes. I’ve used it on all of the carrot cakes, hummingbird cakes, Italian cream cakes, and red velvet cakes when running the bakery. I haven’t changed a thing. There’s no secret withheld from you here. Just follow the mixing order and you’ll have frosting so amazing people will talk about it for weeks. First, gather your ingredients. 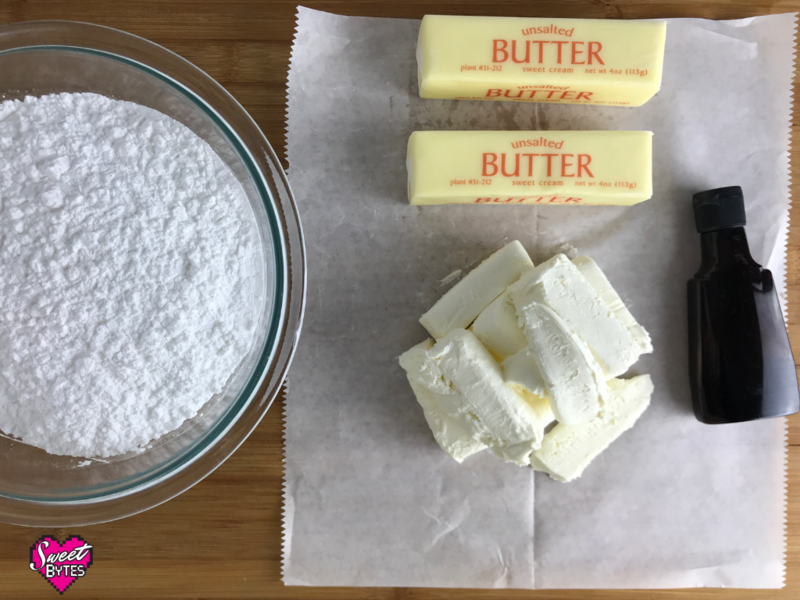 Set your butter out to soften, make sure you have enough cream cheese and powdered sugar, and get out the vanilla. Surprise! You do not have to soften the cream cheese. Cream cheese is really soft enough on its own. I do cut it into easy to use chunks. After the butter is softened just measure your powdered sugar THEN sift it to make sure there are no hard lumps. This is such a pure and simple recipe, that’s all there is to prepare. Here’s where the magic happens. A lot of cream cheese frosting recipes will have you start the butter and cream cheese in the mixer at the same time, but I learned better now I do better. 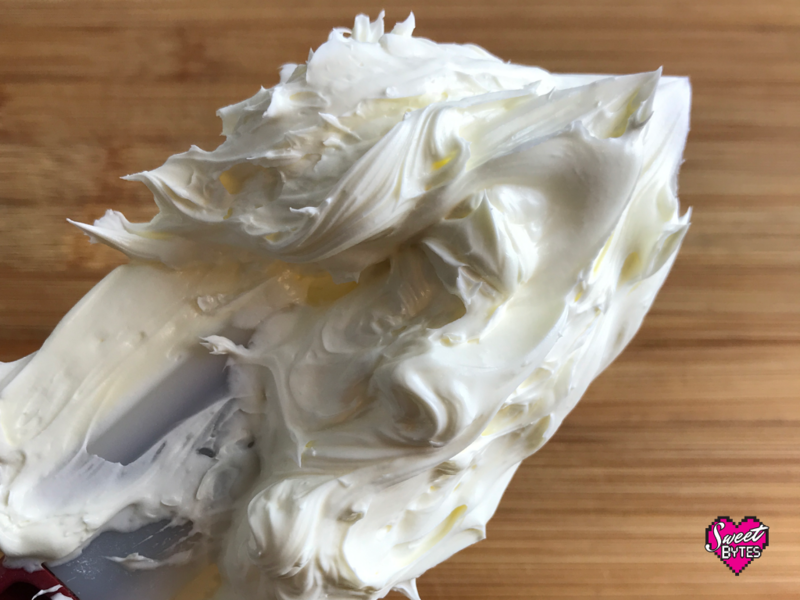 For a stiff frosting that will hold a peak, begin with only the butter and beat it on high (using the paddle attachment if you have a stand mixer) for 8 minutes to get that super light and silky whipped texture. Scrape the bowl at least one time during this process. The butter will really transform into something spectacular. Add in the cream cheese after this point so the cream cheese doesn’t get overly soft from all the mixing. Lower the speed of the mixer and add in the cream cheese, a little bit at a time. Mix until the cream cheese is well blended. After that, turn it up to high for about 30 seconds to add a little fluff. Next, add the sifted powdered sugar and vanilla. Stir this with your spatula and get all of the powdered sugar mashed into the butter so that it doesn’t create the dreaded cloud of powdered sugar all over your kitchen. Mix on low at first, then bump it up to high for no more than 2 minutes, scraping the bowl as needed. When finished, the cream cheese frosting should be smooth and have no lumps of cream cheese or powdered sugar. Use it right away or store it in the refrigerator. Since it is made out of cream cheese, it will have to be stored in the refrigerator. You can leave it out for 2 hours after it reaches room temperature, but any more than that and you could be entering into a food safety issue. If you have leftover, store it in the refrigerator for up to 2 weeks or freeze it in an airtight container up to 3 months. It makes an awesome topping for cinnamon rolls and such, you won’t regret having a little stash tucked away! A cream cheese frosting recipe where the flavor of cream cheese shines and the sweetness isn't overpowering. Spreadable, pipable, and completely eat with a spoonable. Beat butter on high speed until it is lightened in color and fluffy. Scraping bowl as needed. Turn mixer to low speed and add cream cheese to butter. Add about 1 oz. of cream cheese at a time, mix until cream cheese is incorporated. Scrape bowl as needed. Turn mixer to high speed for about 30 seconds. Turn off the mixer. Add vanilla and powdered sugar, hand stir with a spatula to roughly mix. Beat on low speed until all of powdered sugar and vanilla is incorporated and there are no lumps. Scrape the bowl then turn the mixer on high and beat the frosting for 1 more minute until light and fluffy. Use right away or store in the refrigerator for up to 2 weeks. Can it be piped? Yes, it can be piped. The warmer it gets, the more liquified it becomes. Keep it on the cool side and it will pipe beautifully. Is this a crusting cream cheese frosting? No, this recipe will not crust. It stays soft. Can this frosting sit out? It can sit out after reaching room temp for about 2 hours. That’s roughly 4 hours total on a typical chilled cake indoors. If you were in a warmer environment that would be less time. Should I use it under fondant? No, I wouldn’t. If I had to use fondant with a cake that required cream cheese frosting, I would fill the cake with the cream cheese frosting and frost the exterior of the cake with buttercream or ganache. How can I thin this frosting? I use temperature to thicken and thin it. I microwave it a few seconds to make it pourable and put it in the refrigerator when I need it to be more firm. You could also use milk or cream. What goes with cream cheese frosting? My choices are carrot cake, hummingbird cake, pumpkin cake, red velvet cake, and cinnamon rolls. I think the better question is what DOESN’T go with cream cheese frosting! I hope that you will love this recipe as much as my family does! Let me know if you try it. If you have any questions or comments, feel free to send me an email or leave a comment below. Stay in touch by signing up for my free newsletter, I’ll send you an email about twice a month with all the delicious news!